Hughes, who turned 17 last Wednesday, was naturally delighted with his success but revealed that his expectations were low after his first group-stage match. “It feels pretty good,” he said. “But I wasn’t feeling too good about today after my first game with Oliver because I wasn’t playing very well and he smashed me. The former Silver and Bronze rankings winner, who had never before reached a Gold final, progressed from his group in second place. He then recorded a 2-0 quarter-final victory over Londoner Marcos Dayao, who had beaten Hughes 2-1 at the same stage on the EASB Regional Junior Tour South in Maidenhead the previous day. Hughes booked a date with 13-year-old Sykes with a fine 2-1 win over home player Elliott Weston. “That was tough,” he said. “But it was a good game. Earlier, Jamie Wilson wrapped up a 2-1 victory over Connor Benzey (Eastleigh) in his first group match with the day’s highest break of 104. It was his first Cuestars century and a fifth in total. It was also the first ton recorded in a Cuestars Under-21 ranking event since Alexander Ursenbacher, now a Main Tour professional, chalked up a 101 in Gloucester just over six years ago. 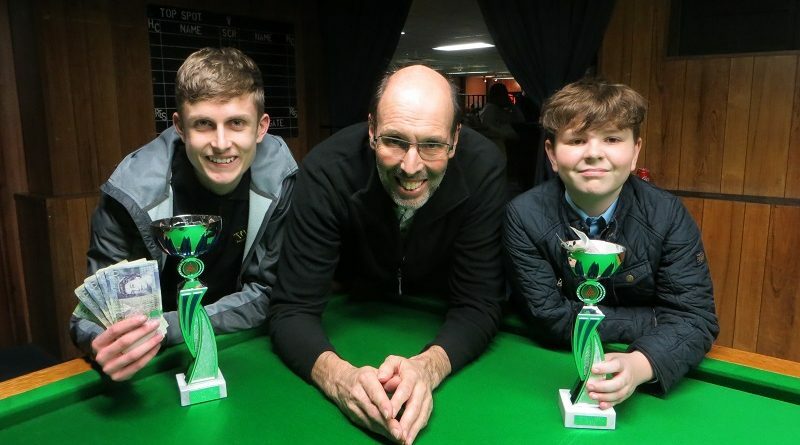 The 15-year-old from Havant was eventually knocked out 2-0 in the semi-finals by Sykes after a fine 2-1 victory over reigning rankings champion Bradley Cowdroy (Bournemouth). Sykes has a 15-point advantage over Cowdroy at the top of the rankings. Weston is ten points further back in third place. Elliott Weston: 75, 56, 50. ROUND-ROBIN GROUP A: 1st, Oliver Sykes (Chandlers Ford SC); 2nd, Ryan Hughes (Chandlers Ford SC); 3rd, Steven Hughes (Chandlers Ford SC); 4th, Riccardo Drayton (Chandlers Ford SC). ROUND-ROBIN GROUP B: 1st, Elliott Weston (Top Spot, Havant); 2nd, Bradley Cowdroy (Greenbaize, Bournemouth); 3rd, Dan Sykes (Chandlers Ford SC); 4th, Chloe White (Waterlooville Sports Bar). ROUND-ROBIN GROUP C: 1st, Marcos Dayao (Hurricane Room, Kings Cross); 2nd, Jamie Wilson (Waterlooville Sports Bar); 3rd, Connor Benzey (Chandlers Ford SC); 4th, Ronnie Sullivan (Frames, Coulsdon). QUARTER-FINALS (12 points): O Sykes 2-1 D Sykes, Wilson 2-1 Cowdroy, Weston 2-1 S Hughes, R Hughes 2-0 Dayao. SEMI-FINALS (15 points): O Sykes 2-0 Wilson, R Hughes 2-1 Weston. FINAL (£100/£25, 25/18 points): R Hughes 2-0 O Sykes. From left: Ryan Hughes, sponsor Trevor Sanders, Oliver Sykes.